Rated PG-13 for bloody accident images, some violence, thematic material and brief strong language. Any description of "Rememory" is bound to make it sound more inviting than it is. I was, admittedly, drawn in by the story's high-concept premise: Gordon Dunn (Martin Donovan), the inventor of a cutting-edge, memory-extracting machine, is found dead, and it's up to mysterious friend Sam Bloom (Peter Dinklage) to solve the case. Gordon's device is intriguing because it gives us a supposedly objective window into any user's past. When you see the past through this invention, you're supposedly watching events replay without the impediments of personal bias, or natural forgetfulness. Better yet: as you watch footage recorded directly from users' brains, you assume the position of the person revisiting their past. The camera shows us what users observed in the past during major life events, like birthday parties, breathtaking trips to exotic locations, moments of physical intimacy with loved ones, or even screaming matches with those same loved ones. Unfortunately, co-writer/director Mark Palansky doesn't do enough with this fantastic main conceit. There is nothing vicariously joyful about Sam's process of discovery, nor any memorably provocative moments of reflection from Gordon's patients, almost all of whom regret having gotten involved with him, and his futuristic memory. Instead, we watch as Sam drifts from one encounter to the next without making a lasting impression. It's a maddening experience, watching a film with a great kernel of an idea fail to grow into something equally impressive. We start from the premise that Sam Bloom is, like so many amateur detectives, a stranger observing a gallery of loosely-connected outsiders. Gordon's death has not been officially called a homicide, but that doesn't matter to Sam. He knows that any blemish on Gordon's legacy could negatively affect his company Cortex, represented in the film by selfish bureaucrat Lawton ("Lost" star Henry Ian Cusick), and nervous flunky Neil Frankel (Chad Krowchuk). So, Sam starts his own independent search for answers, starting with an impromptu meeting with Gordon's widow Carolyn (Julia Ormond). During this casual conversation, Sam steals Gordon's memory-transcribing prototype, and proceeds to track down Gordon's patients. During this process, Sam lies to suspects and their family members about his own identity. He assumes false names, and is evasive about his personal connection to Gordon. But viewers know, thanks to an early conversation with Carolyn, that Sam and Gordon met by chance during a thunderstorm at a hotel bar, and made a deep connection after much imbibing. Sam and Gordon's bond is largely represented through Dinklage's impassioned line delivery, and his character's recollection of his eventful evening with Gordon. Palansky also shows us a snippet from Sam's memory of Gordon, laughing and smiling beatifically as he's pelted with enough rain to give the healthiest male athlete a crippling case of pneumonia. Sam's memory looks like a film school student's approximation of a post-"Tree of Life" Terrence Malick flashback, only it's been lensed by one of the featured photographers in those eye-roll-inducing "Shot on iPhone" advertisements. So while this scene should be dazzling and tantalizing, it's unconvincing and banal. The limitations of Palansky and co-writer Mike Vukadinovich's shared vision are, realistically, the biggest problem with "Rememory." They don't spend enough time examining the fundamental disconnect between the way characters see themselves, and their true, "objective" nature, whatever that might be. Maybe the deciding moments in characters' lives play out exactly as they are remembered. Or, more likely, maybe people don't recognize the people they once were. I couldn't tell based on chopped-up, over-prettified flashback fragments because these characters are valuable to Sam as suspects. They stop mattering to him after he's sifted through their backstories, and determined if they were a threat to Gordon. So we don't learn anything substantial when, by film's end, Sam has a breakthrough, and realizes that all he was looking for was "focus" and "resolution," and not clarity, or closure. There's a difference between these two sets of values, but you couldn't tell based on "Rememory." Palansky and Vukadinovich never accomplish what the makers of other superior films, like "Defending Your Life," "After Life," or even "Human Nature," previously did by forcing their characters to reconsider the impact they've had on others' lives. 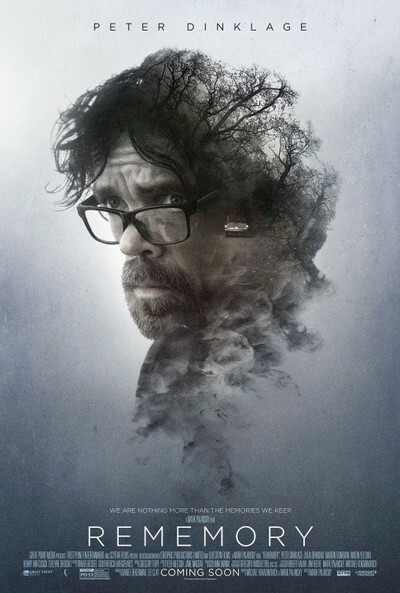 I really wanted to like "Rememory," if only because I normally enjoy the work of its talented cast members, especially Dinklage, and the late Anton Yelchin, the latter of whom has a negligible, minutes-long walk-on part. But to enjoy "Rememory," you have to care about Palansky and Vukadinovich's plot as a character-revealing mechanism. "Rememory" never works as a procedural, so it's an unsurprisingly lifeless piece of science-fiction.